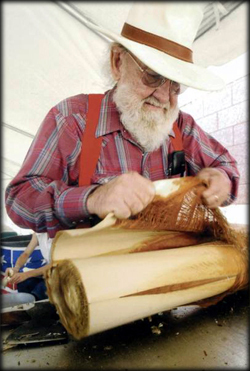 When Bill Barnes, the Executive Director to the Historical Society of Burkittsville, Maryland passed away a few years ago, among his estate, seemingly well hidden in a locked box stored deep within the confines of his small attic, was discovered an old, decrepit journal from the 1700's. This journal was written entirely in Gaelic on rather brittle and fragile pages, some of which were torn from the binding. Upon closer inspection and translation, it was further discovered this journal appeared to be either an actual memoir of Elly Kedward's, or a transcript of some nature. It can be said it was the long-lost "Diary of Elly Kedward." But this diary was never "lost." Instead, it was never revealed. 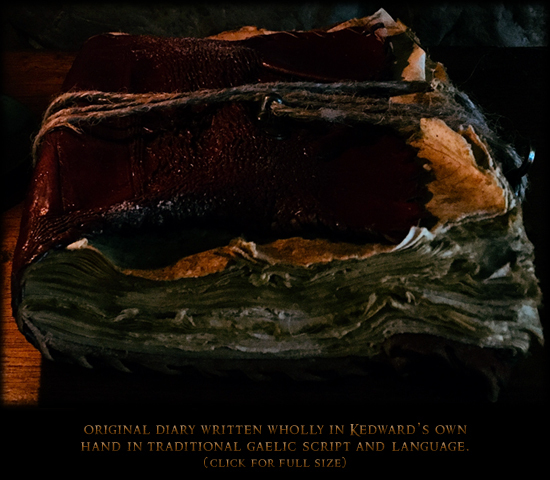 In the over two hundred years since Kedward's death, the existence of any such diary had never been disclosed, either by Barnes himself, nor by any other individual, organization or entity prior. Why this is, is unknown. Mr. Barnes never disclosed any such possession, nor ever discussed it with any known colleagues, friends or family. The fact it exists at all, and in addition was in possession by Barnes draws contrast to his proclaimed knowledge of Elly Kedward and the legend surrounding her fate, which in contrast makes it appear profoundly limited, indicating potentially concealed knowledge Barnes chose not to share. There are theories to his motivation, but nothing conclusive. 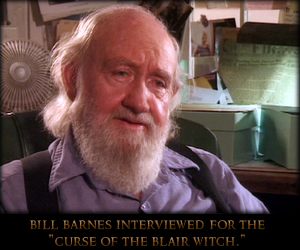 As curator and director of the Burkittsville Historical Society, for a short time Barnes was custodian for a rare book about the occurrences surrounding the Blair Witch legend entitled "The Blair Witch Cult," a supposed collection of first hand accounts that illustrate the effects of the infamous Blair Witch. This only known copy, originally discovered in 1809, was on loan to Barnes and the Burkittsville Historical Society courtesy of the Maryland Historical Society for purposes that Barnes would transcribe the original manuscript. When the Maryland Historical Society called for its return, Barnes was reluctant to do so and staunchly argued it should remain in Burkittsville. "Over my dead body," Barnes was quoted as saying in regards to returning it. Burkittsville is but a small town, made up of a rural population of less than 200 residents. The state of Maryland has a population of 6.016 million, and the state historical society was quick to remind Bill Barnes of this and that it was on loan only. Ultimately Barnes returned the book to the state. Following his death, to discover Barnes had been in possession of a direct, hand-written memoir of Elly Kedward, the woman history has for centuries labeled as the Blair Witch, and ultimately lost her life to that accusation and prosecution, is extraordinary to say the least. As mentioned, history has never known there to be such a journal. Of course it is possible it existed. When Kedward was accused, local authorities searched her home thoroughly and very well could have discovered the journal then. Yet, for centuries since it was never revealed. This opens a series of questions. Since this development, the diary has been closely examined by forensic experts at Federal Forensic Assoc. in Raleigh, NC with radiocarbon dating and determination to be authentic to its period of the 18th century in both the paper and ink. That, in addition to the Gaelic translation conducted by the Department of Irish Studies at Princeton University, indicates it to be a diary in nature, having been written in first person. Whether or not the journal was a date specific chronicle of time or recollective memoir is not known. The period of time from initial to latest entry does not give a specific timeline of entry other than matured handwriting which is consistent, though does reveal entries made over a period of years. What remains a further mystery, is the last several pages are torn from the journal and assumed missing. The diary entries conclude with Kedward's voyage to America on the shipping vessel the "Reliant" in 1769. Kedward was presumed dead in 1785, leaving sixteen years potential absence of entries and/or recollections. The coincidence the American period entries are torn and removed from the journal can only be assumed suspicious, considering the circumstances of her prosecution and subsequent and assumed death. It was also determined by the forensic laboratory those pages were removed in the late 18th century. As a result, this discovery generates more questions than answers. 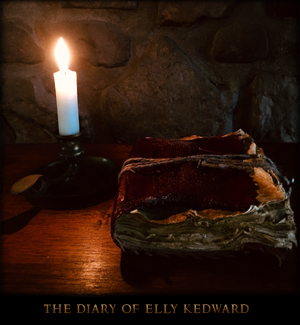 If Elly Kedward kept a diary, and it was only discovered in the last year, where had it been for the last 200+ years, and considering all the events that occurred since, yet this "diary" never surfaced in that time. Why is it that pages following entries up to and including Kedward's voyage to America are torn and missing from the journal? Were there entries made since that voyage, were there entries made during Kedward's sixteen years in Blair? How did Barnes come into possession of the diary, from what source, for how long, and why did he choose to not disclose this fact? Barnes had given several interviews over the years regarding Elly Kedward and the Blair Witch legend, was it to keep any knowledge of its existence from the Maryland Historical Society, of whom he was at odds with? Yet if so, that's Barnes' reason, what of the reason for 200 years prior? The Trial of Elly Kedward website and presentation is based upon and constructed through the entries of the journal with proof-of-concept material to visually represent those entries.